Charles has a new buddy. Red CoAt Is Back! The biggest reveal from tonight’s new episode of Pretty Little Liars is that ChArles is not alone. He has a buddy who looks smashing in a bright red coat. Why all of a sudden. Where has she been all this time? And where is Black Widow? Are they the same person? And just what is their motive? The episode was full of red herrings that probably won’t amount to anything or matter at all. Aria’s cute new photographer friend Clark, played by Titus Makin Jr., is suspiciously asking questions and meeting with Jason’s doppelganger, Reese. Spencer and Hanna discover Reese while trying to find out where Hanna’s scholarship money came from. They automatically assume he’s Charles. Charles crashed Aria’s gallery opening by posting pictures of the girls in the morgue to prove that he wants them all back. Will he succeed? Post your theories below! Are Wren, Melissa, and CeCe behind all this? Does anyone care about CeCe? Only one more episode until the girls come face to face with Charles. Next week on Pretty Little Liars 6×09, we see that it’s time for Prom. 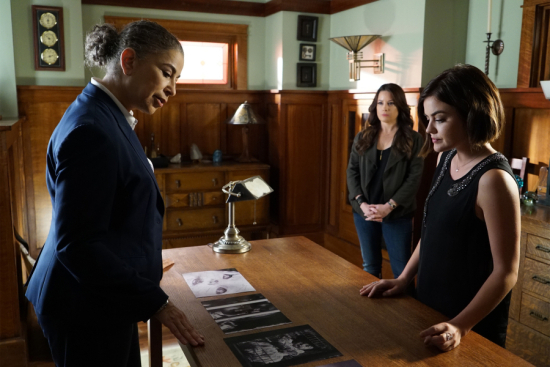 What are your thoughts on Pretty Little Liars 6×08?